Explore Pike Place Market, Seattle’s top attraction, in a way that most locals haven’t even experienced — with an early-access tasting tour. Discover the market’s many delights as you visit eight different food and beverage vendors for 16 tastings of fruit, salmon, pastries, coffee and more. You can interact with merchants before the crowds arrive, and you’ll have a knowledgeable guide to expertly lead you around, entertaining you with stories about the market's history and culture. This Viator Exclusive is available nowhere else and is limited to 12 people, ensuring you enjoy a small-group experience. Your behind-the-scenes tour begins inside Pike Place Market at the Market Theater, where you’ll meet your local guide, a Pike Place aficionado who will regale you with fun facts and stories about the market’s history as you enjoy your 2-hour tour. Come hungry, as tastings are plentiful and add up to a full meal! Spend a few minutes gazing at the infamous chewing-gum wall, adding your own colorful mark if you want. Then head to the main entrance of Pike Place Market, listening to your guide’s story about how the market got its start more than 100 years ago. Your first tasting is a cup of Seattle coffee — what else? Learn about how Seattle became the caffeine mecca that it is as a talented barista makes you a latte; steamers and tea are also available if you prefer. 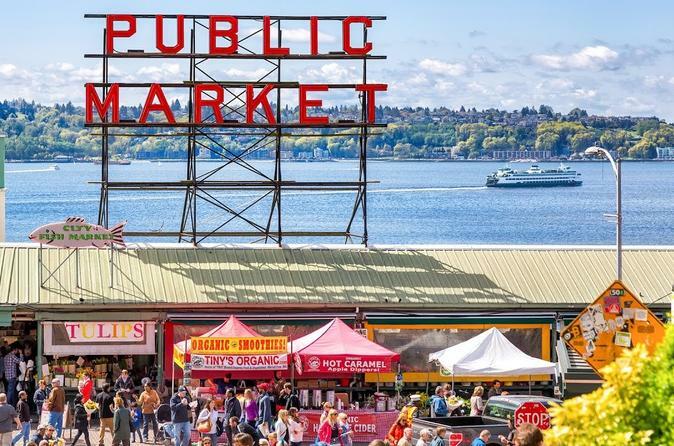 Continue your tour around the market, stopping at a total of eight different vendors to enjoy at least 16 tastings, from Seattle mainstays like smoked salmon and cheddar biscuits to creative bites like szechuan flatbread. Because your exclusive tour takes place right as the market opens, you’ll avoid the crowds typically found later in the day, offering the chance to chat with vendors and merchants before they get busy. You can even go behind the counter at the fish market to toss a fish through the air, just like the market’s famous fishmongers. When your tour ends, continue exploring the market on your own, using your included VIP savings card to shop for tasty souvenirs and gifts to take home.